Custom eagle sunglass belongs to the league of elite fashion accessory, which never losses its charm. This eagle sunglass is sought by fashionistas because it offers them easy attention in any party and other crowded places. This sunglass has got metallic finish frames with semi rimless smoke lens and it is made up of UV material. 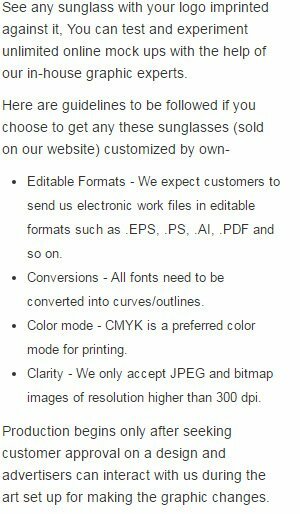 Advertisers can always make use of the lens area in the sunglass to make their business messages seen.